Some have skills, some have great skills, but do you have the skills to master our Devil Stick and be Down Right Naughty? 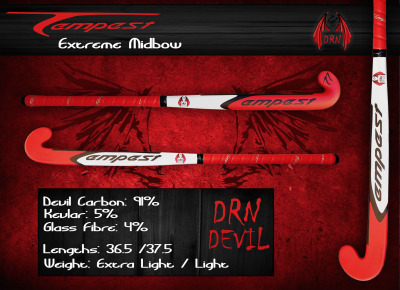 Our DRN sticks have been specially designed for players who the skills to be just Down Right Naughty on the pitch, extreme power, huge control and just that little bit Devil to allow you to out Trick, out Hit and basically outplay any who dare oppose you! Extreme Mid Bow (Not a low bow) to give you Trick Flickability with the control and feel of Midbow.